GO TO OPEN ACCESS Chem. Eur. J. 2019, DOI: 10.1002/chem.201806169. We disclose the results of our investigations on the influence that the insertion method of aryl‐extended calixpyrrole into liposomal membranes exerts on their properties as anion carriers. We use the standard HPTS assay to assess the transport properties of the carriers. We show that the post‐insertion of the carrier, as DMSO solution, assigns better transport activities to the “two‐wall” α,α‐aryl‐extended calixpyrrole 1 compared to the “four‐wall” α,α,α,α‐counterpart 2. Notably, opposite results were obtained when the carriers were pre‐inserted into the liposomal membranes. We assign this difference to an improved incorporation of carrier 2 into the membrane when delivered by the pre‐insertion method. On the other hand, carrier 1 shows comparable levels of transport independently of the method used for its incorporation. 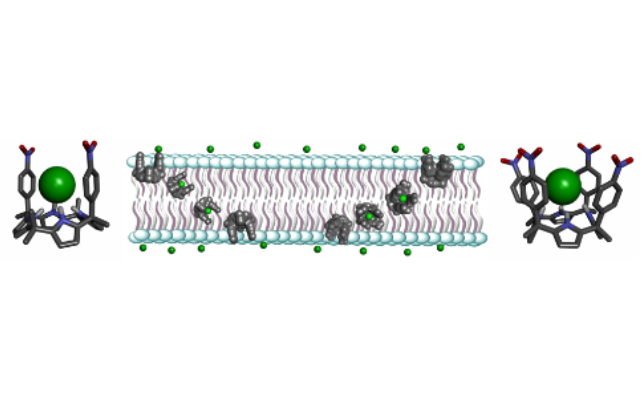 Thus, an accurate comparison of the chloride transport activities featured by these two carriers demands their pre‐incorporation in the liposomal membranes. In contrast, using the lucigenin assay with the pre‐insertion method both carriers displayed similar transport efficiencies.